Pillow protection is ideal to protect your investment in your new pillows. 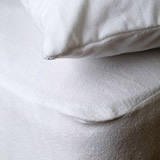 Night sweats can leave unsightly staining which can be difficult to get out in the wash. 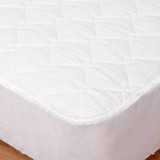 It also creates permeating odours so we recommend that you invest in good quality cotton quilted pillow protectors. They will make the bed look plush and inviting and smelling fresh. The pillow protection products in our range are superior in quality and are able to withstand regular washing at 60 degrees. For people who sweat more profusely at night we recommend the range of Nightlife waterproof pillow protectors. Nightlife waterproof mattress protection is also available in this range in single, double, king, superking.